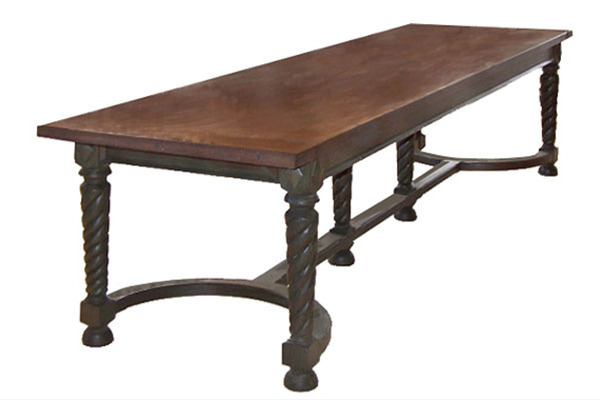 This is a great 32” x 10’ dining table made from recycled 2" chestnut planks. Black over green semi transparent milk painted base with handcarved turned and spiraled legs with carved appliques on the corners. I wasn't sure about the stretchers at first, but now that I've had dinner there acouple of times, it's not in the way and is interesting when you're sitting there. Lives in an old farmhouse in Tinmouth, Vermont. Price is dependent on the price and availability of recycled 2" chestnut planks.